CCL Messageboard » The Water Cooler » Sports » Hogs in a blanket and other game time fare. 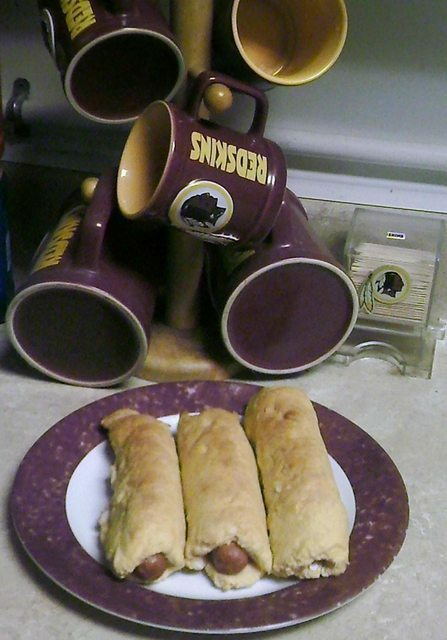 Hogs in a blanket and other game time fare. I've got plenty of full size dogs. Small packs of nacho cheese dippinng cheese. I didn't get mom to pick up those small packs of little smokies but I'm thinking there must be a way to turn what's already here into something Redskins O-Line size and delicious. Easy way out is to open the biscuits, roll them flat and wrap the dogs in sliced american cheese and a biscuit, oven bake. I'm wondering if I can turn the flour and cheddar cheese sauce into something into even tastier. Anyone tried deep frying instead of oven baking? What are you creating for game time? 3 Touchdowns so I made 3 Hogs in a Blanket, one wrapped up completely to remind 26 to wrap that ball up when he's out on an evening jaunt through the secondary and beyond. Little milk, tossed in some self rising flour, several heaping spoons of cheddar cheese sauce, combined until doughey, rolled out with a rolling pin and cut into thirds. Baked at 350 for about 25 minutes or so. Brushed with some melted margarine after coming out. Now to get some chili to dip them in and some ketchup. Cooked that up making sure that the beef was super crumbly. Laid out a sheet of Puff Pastry and cut into 1/8ths. Tablespoon of the beef then fold the pastry over top, sealing the meat inside. Lay them out on a sheet tray, poke holes in the top with a fork (that prevents them from steaming inside and becoming soggy) then brushed with an egg wash to make them shiny once cooked. Bake at 425 degrees for about half an hour. Made about 40 of them and people gobbled them up! I saved a couple for lunches this week. Today I made BBQ Baby Back Ribs, cole slaw and baked beans. Mmmm! !